USA Fire Door is a nationwide distributor of heavy-duty commercial doors, frames and hardware. We offer a large selection of commercial door products for distribution to all 50 United States and abroad. Our product lines include commercial steel doors, hollow metal door frames, commercial solid core wood doors, high pressure plastic laminate doors, interior aluminum door frames, timely door frames and more. We offer low cost factory manufacturing options, custom sizes on almost all products, custom hardware prep, and a quick ship program for fast turnaround time on smaller jobs. Commercial steel doors, also known as hollow metal doors include a wide range of material options for steel types and the internal core of the door. Hollow metal doors are preferred for their durability, security, resistance to fire and ability to accept a wide range of commercial door hardware. Common steel thicknesses include 18 gauge, 16 gauge and 14 gauge and typically supplied in galvanized or cold rolled steel with a baked on factory primer. Commercial steel doors can be factory modified to accept a wide range of hardware, vision lite window kits and metal louver door inserts. Solid core wood doors are frequently used in commercial applications. Most commercial wood doors are available in a variety of sizes and factory finishes. Wood doors are commonly used for offices, schools and hotel doors. Wood doors can be fire rated from 20 minutes up to 90 minutes and can be factory prepped to receive custom hardware, hotel lock prep, window inserts and louvers. High pressure laminate doors are often preferred against their wood veneered counterparts for their low maintenance, scuff resistance and longevity. Plastic laminate doors are constructed with the same internal composition as a solid core wood door but include high pressure laminate faces and edge banding in place of a natural wood veneer. These commercial laminate doors are available in hundreds of different high definition patterns that include realistic wood grains, abstracts and solid colors. All commercial laminate and wood doors can be factory prepped for commercial hardware, vision lite inserts and louver vents. Hollow metal door frames, Timely prefinished steel frames and interior aluminum door frames are among the most common types of commercial door frames. 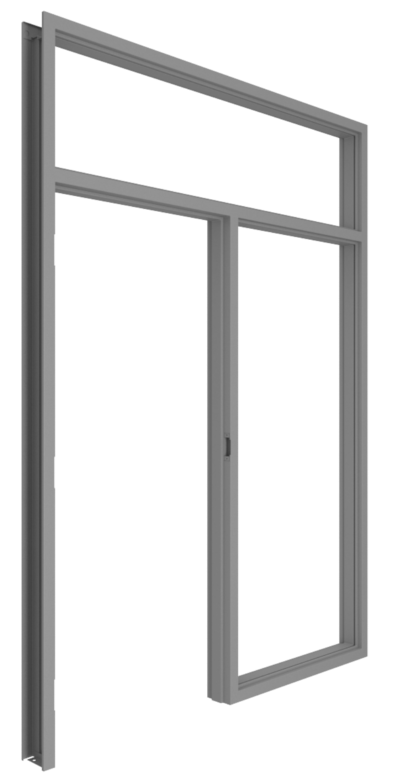 Hollow metal door frames are a heavy duty steel frame that can be provided as a knocked down or welded assembly. 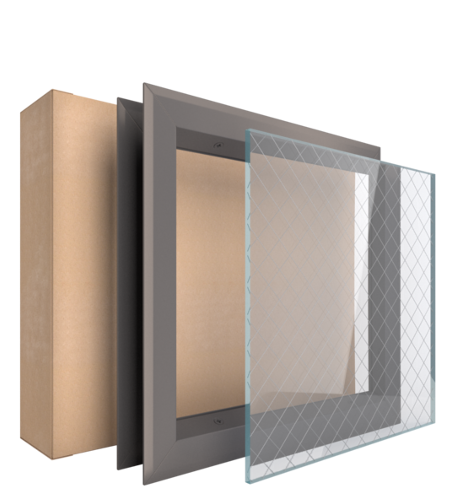 Hollow metal frames are typically sold primed and ready for paint for use at interior or exterior openings. Timely frames are most commonly used with wood doors for interior office applications. Timely frames are factory finished, readily available and easy to install. Interior aluminum door frames feature an extruded aluminum profile with crisp edges, sleek modern design with dark bronze or anodized aluminum finish. 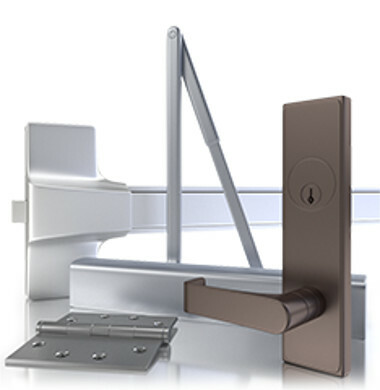 Selecting the right hardware is critical to the function of the door. Commercial lever sets and exit devices must be compliant with building standards. Commercial door closers and perimeter smoke gaskets are typically required at fire rated openings. We specialize in providing standard duty grade 2 and heavy duty grade 1 hardware solutions with exceptional pricing and one on one customer support. Vision lite inserts are typically used to add a window to a commercial door. Vision lite frames and complete vision lite kits are available in a wide range of finishes and glass options. Fire ratings vary by glass size. Metal louver inserts can provide ventilation to a room when installed in commercial doors. Steel louver door inserts can be fire rated up to 90 minutes in sizes of 24” x 24” or smaller.